Gifted young Russians should “most importantly” work for the glory of their country, President Vladimir Putin said Tuesday at a new center for gifted students in the southern city of Sochi. The center, which has been named “Sirius,” after the brightest star in the night sky, offers special programs for students who have demonstrated exceptional abilities in the sciences, sports or fine arts. Students who are accepted to Sirius receive free room, board and travel to and from the center. But he also took the time to warn the students about the dangers of participating in political protests and demonstrations. “The lessons of unrest, revolutions, the civil war warn us about the deadliness for Russia of any schisms, and convince one that only the unity of the people and the public accord can lead to success, ensure the independence of the state, and help rebuff any powerful and treacherous enemy,” Putin told the gathering. Warnings against political protests have emerged as a recurrent theme in Putin’s public appearances lately, reflecting the Kremlin’s desire to avoid opposition demonstrations of the kind that toppled the Moscow-backed administration in neighboring Ukraine last year. “I count on it that after returning home, you will preserve the atmosphere of friendship acquired at Sirius, will strengthen in your desire to strive for even greater successes in the name of the occupation you have chosen – be it in science, sports [or] art – and, most importantly, in the name of our beautiful Motherland,” Putin said. Putin’s comments also reflect the government’s concerns about highly educated young Russians leaving the country. At a speech at the Council for Science and Education this summer, Putin accused foreign-backed organizations of working to attract Russia’s most talented young people to their countries through educational programs abroad, state news agency RIA Novosti reported at the time. “A network of [foreign] organizations has ‘rummaged’ through the schools in the Russian Federation for many years under the guise of supporting talented young people. 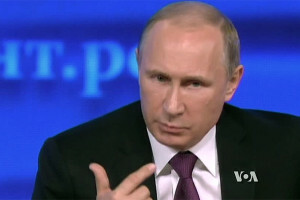 In reality, they simply hoover everything up like a vacuum,” Putin was quoted as saying.